I first learned to key in Ms. Blea's high school typing class. Or rather, I taught myself to type in her class full of two-handed students. I had my own book and my own exercises, which I think my mom had actually provided. I learned on the QWERTY keyboard layout like everyone else, I just had to cover twice the keys with only five fingers. And somehow, even though it was completely self study, I got a B in the class, leaving a permanent smudge on my otherwise straight A transcript. But I knew how to type. 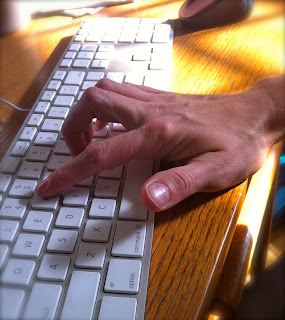 Maybe not fast or without frequently looking at the keys, but I knew how to type. I still consider this one of the most helpful skills I have learned in my life up to now. But then, because I am blessed with parents who rarely just accept the status quo, I was introduced to the Dvorak keyboard layout. This layout was specifically designed to be more ergonomically effective. In layman's terms, the keys are organized on the keyboard in a way that compliments the way your hand and fingers move most easily--vertically, for a keyboard. The Dvorak keyboard is actually more efficient for two-handed typists as well, but most of the world is accustomed to QWERTY. I re-taught myself to type on the Dvorak keyboard the summer before I went to college. The increased speed and ease of typing was remarkable. I never looked back. "What do you mean something's wrong with your keyboard? I was just using it a second ago." ...It's like knowing a secret language. Do I feel superior? Of course. That's what happens when you give a straight A student a B in keyboarding. Let it be a lesson to stubborn typing teachers everywhere. cool...so next year, can you and I get together in Abq. and have a cup of tea or something? ALso, can you send me your address.? I finally have an art card i wanted to send you, with my logo on the back. B??? What toss and rubbish grades are!